BT's home phones have always been a mixed bag - for every one you get that's a beaut, another's a bit of a clunker. Sadly the BT Stratus 1500 is the latter. The problems start when you first fetch the BT Stratus 1500 out of its box. It's massive. Putting it side-by-side against Philips ID555 is like having a size content between Princess Leia and Darth Vader: the Stratus is very, very tall, very bulky and with its gloss-black finish and white-on-black LCD display, pretty intimidating too. The gloom isn't relieved by any fancy lighting effects either. The BT Stratus 1500's LCD is very small and dim for a phone of this bulk and there's no keypad backlight. At least the numbers are big enough and white enough for you to see them in low light. The phone's a lot tackier-looking than the pictures suggest too. Even the build quality's not great. Pressing down on the BT Stratus 1500's keypad moans, groans and creaks more than a galleon of goths awash on a stormy sea. On the positive side, the Stratus 1500 offers a reasonable range of features for your £63. It comes with two handsets, one main station with a 12-minute digital answerphone built in, and a second base station for charging. Both have the same gloss black finish as the handsets, although the answerphone does provide some relief thanks to blue charging status lights and 7-segment LCD which tells you how many messages you have. Another key features is the 100 name-and-number contact book, although frustratingly you can't sync your contacts details across different handsets - you have to enter them over and over again for each one. 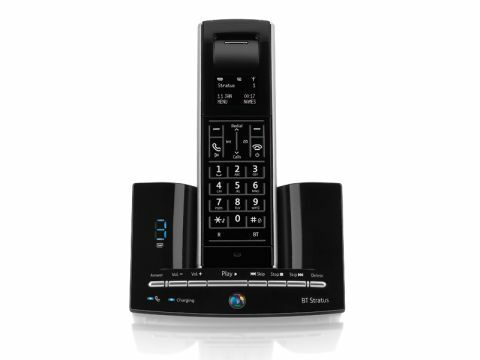 Since the BT Stratus 1500 can support up to 5 different handsets, you could be in for lot of tedious data entry. You can also send and receive text messages. The phone's UI is rather familiar too. In many ways reminiscent of the Philips ID555, it somehow manages to be worse by including the kind of mono icons any 3-year-old could draw, alongside some very spindly text which again is dim white / grey on a very black background. Eyestrain anyone? At least you'll love the ringtones: Bach, Flight Of The Bumblee, and even Reggae get the polyphonic treatment, but the results are so shrill you don't so much want to answer the phone as throw the whole thing out of the window. Call quality is only average, sounding rather tinny and closed in. The Philips ID555 is a much better bet in this respect.